I’m thrilled to be here sharing back to school ideas this morning to help me and my six kiddos this year! I have a love/hate relationship with my kids’ lunches. 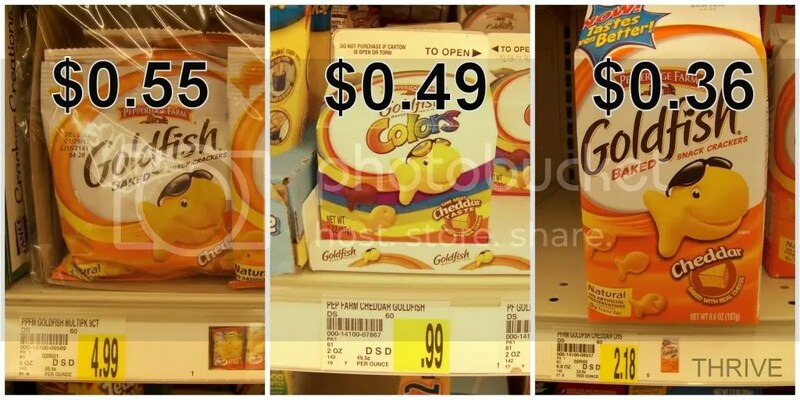 I hate shopping trips with my kids begging for all the pricey, pre-packaged lunch stuff that’s loaded with preservatives and wasteful packaging. Sheesh that junk is expensive. But the convenience? Oh how I love the convenience. 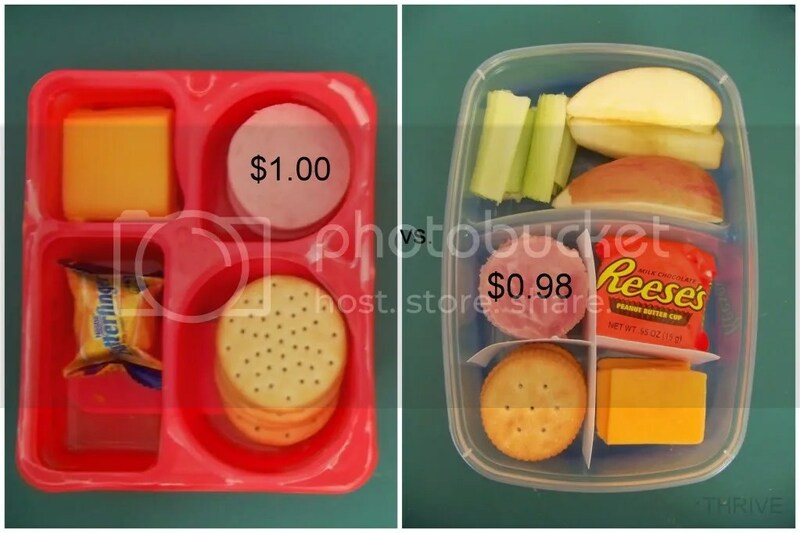 And there are times of the year when our schedule is so crazy that I cave and load up the cart with lunchables, little bags of crackers and jello packs just so that we can pull a lunch or snack together in two seconds flat. I’m here today to share my plan to eat healthier, save money and still enjoy the convenience that me and my kids crave. And I hope you’ll tweak the ideas below to fit your family’s budget and nutritional preferences. 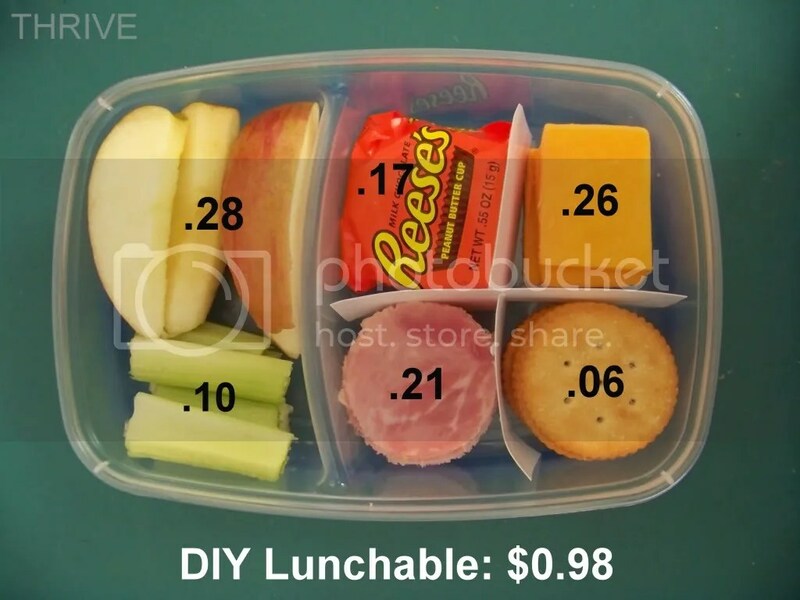 Reusing the store bought tray and packing your own lunch meat, real cheese, crackers and a little treat will save you 40% — $0.60 for homemade vs. $1.00 for the store bought one. Plus the homemade version boasts real cheese, extra calcium and fewer preservatives. A quick layer of Glad press ‘n’ seal or aluminum foil keep everything in place just like the original. 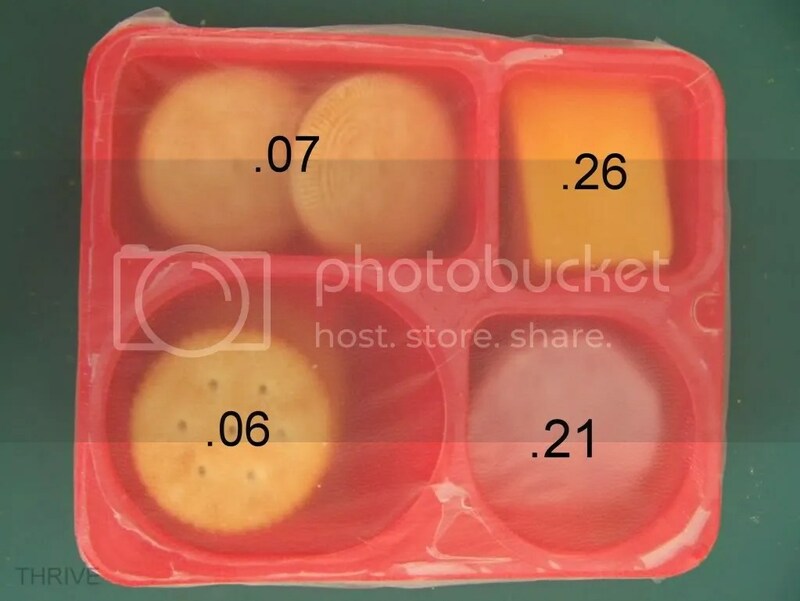 Don’t have a left-over lunchable tray? Or want a bigger tray to up the serving size for older kids? No problem. You make your own dividers like I did for this dollar store container using an empty milk jug. 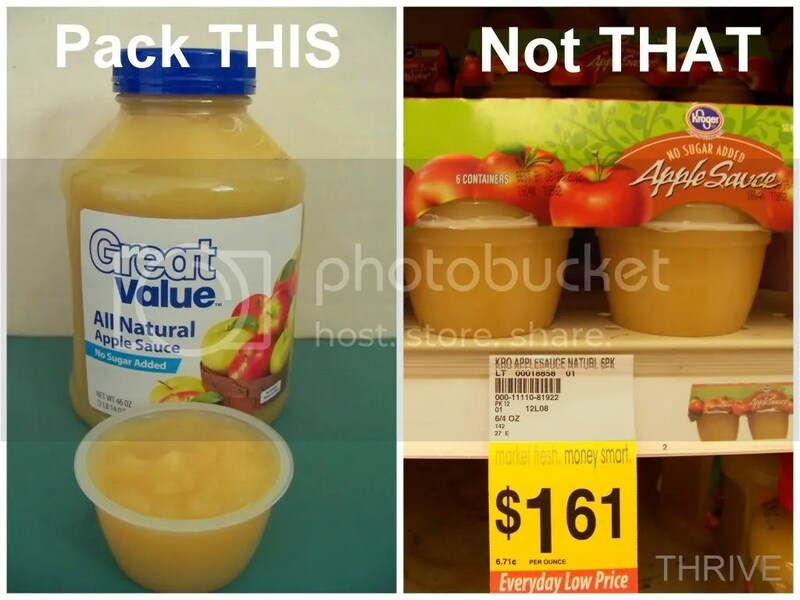 And that extra space means you can supplement that lunchable with some fruits and veggies without spending more than the store bought version. 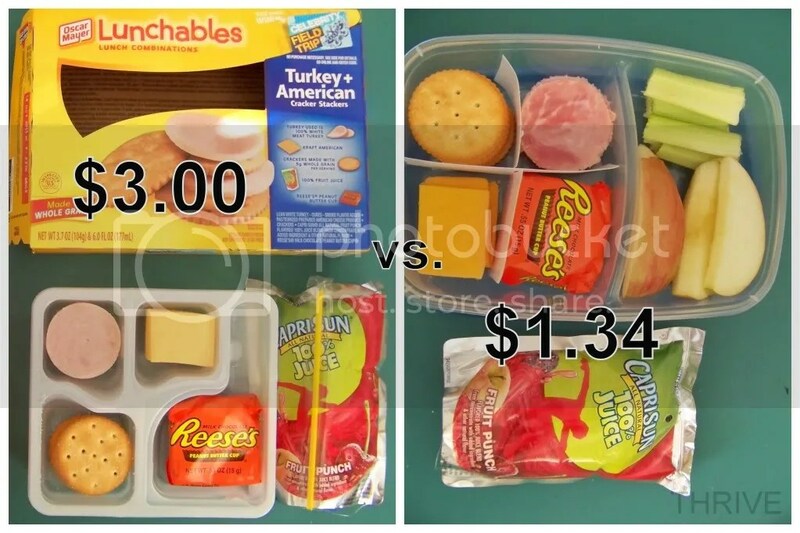 Which $1 lunch would you rather send with your kids? 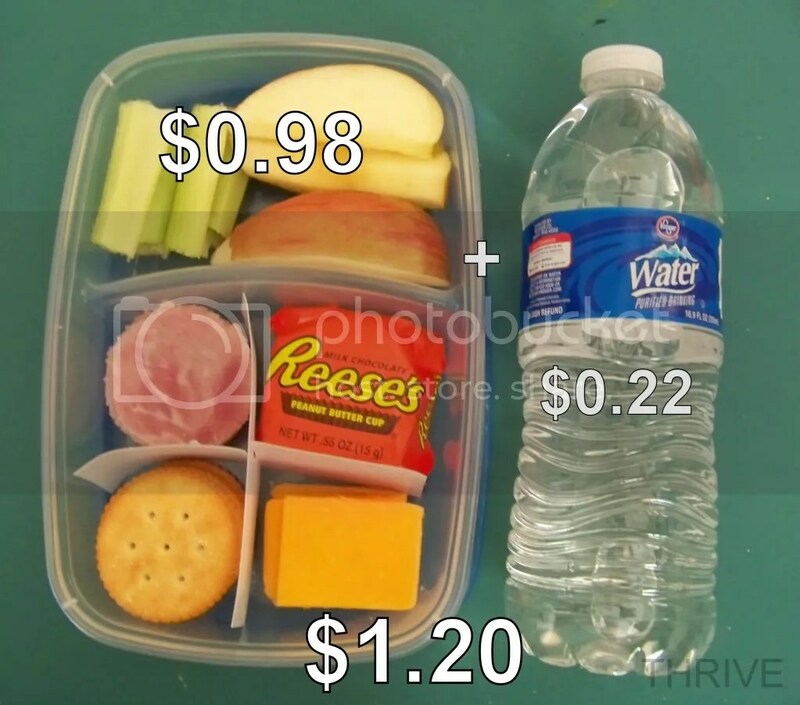 … while I’m more in favor of the reusable water bottle which make lunch $1.20 the first day and $0.98 every day after. So we’ll do both: water most of the week and juice boxes on Friday for a little bit of a treat. Really? 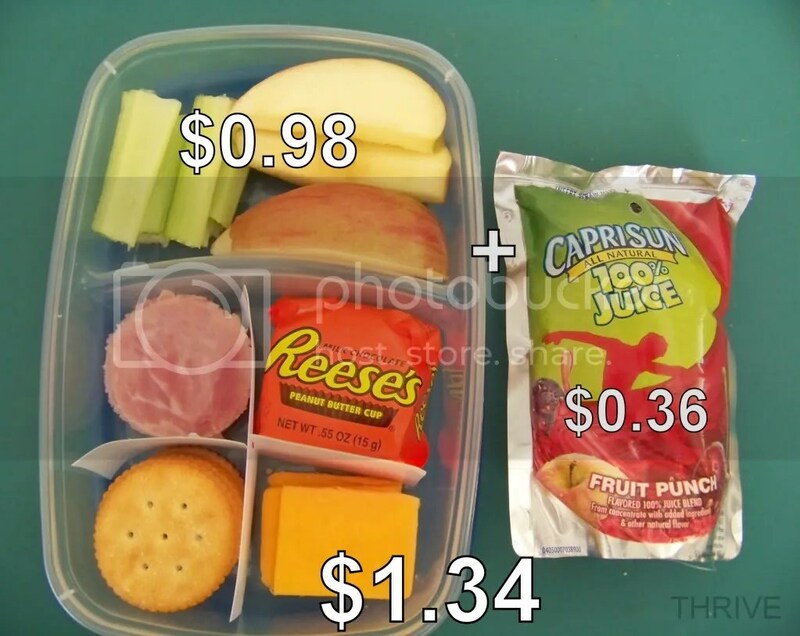 $3.00 for a $1.00 lunchable and $2.00 juice pouch? Um, no thanks. 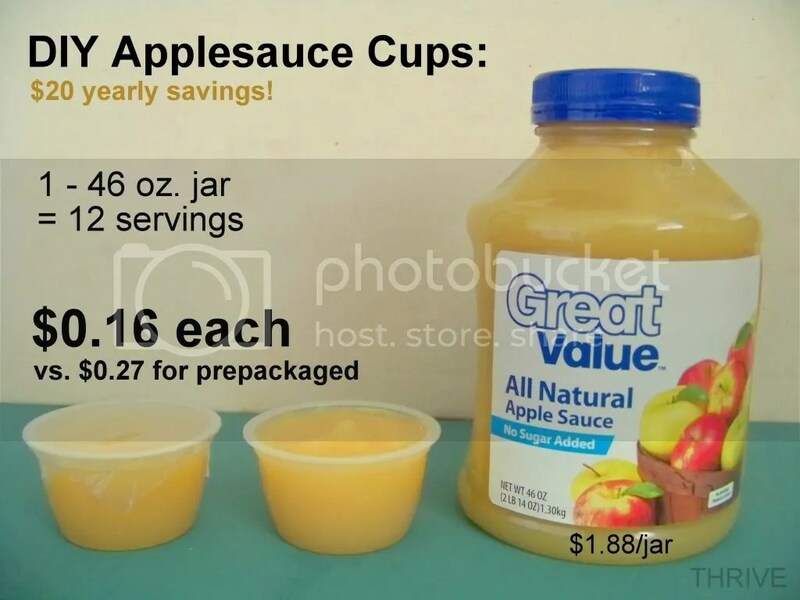 Reusing those little cups (or the small tupperware containers with lids) and making your own will keep the cost and preservatives way down. Making just this switch alone will save you a truck load. 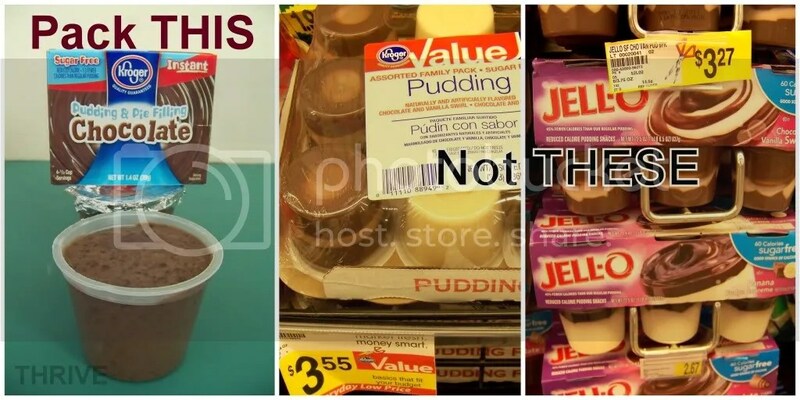 Six cents a cup vs. $0.56 for Jell-o brand? You could easily cover back-to-school paper supplies, back packs and shoes with just that little switch. The reduction in packaging, costs and preservatives make these easy switches. If you don’t mind generic, you can reduce those costs another 50+ percent. 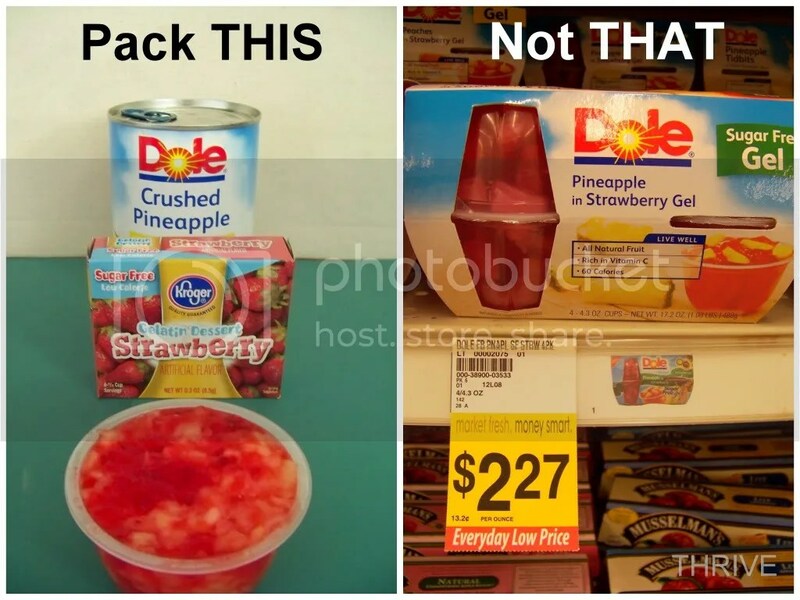 And it’s just as convenient to grab a home-packed bag as the store packaged variety. The only difference is the price. 1. The ideas above are only guidelines. 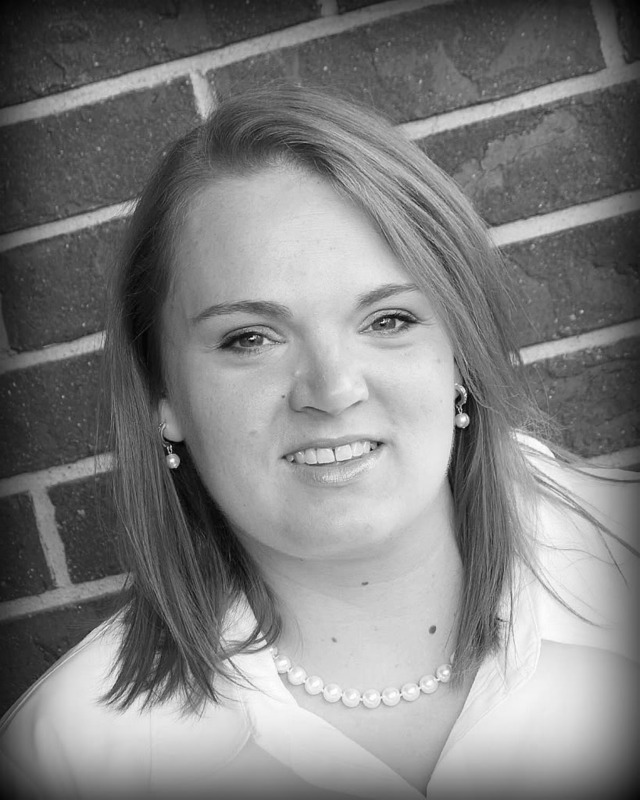 Each family will have their own nutrition and budget preferences. 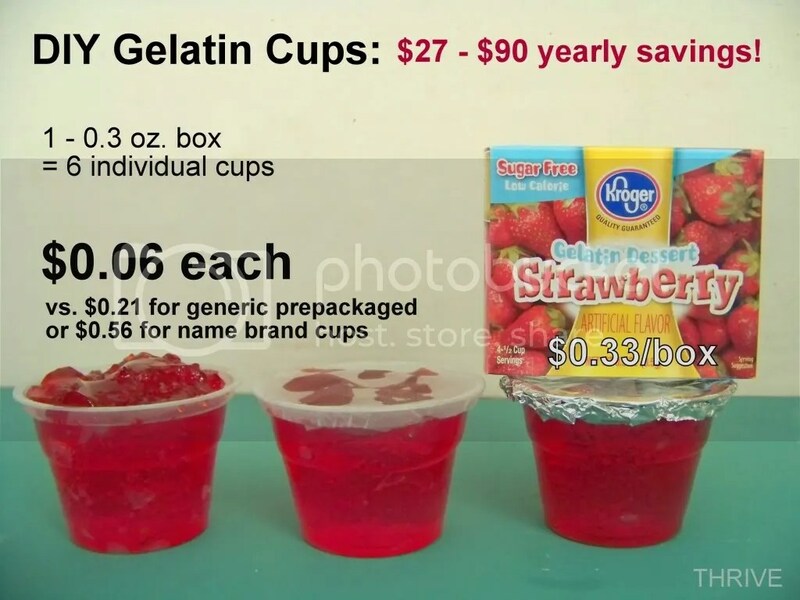 The idea is that by getting creative with recycled/reusable packaging, you can still enjoy the convenience of off-the-shelf while controlling costs and ingredients. 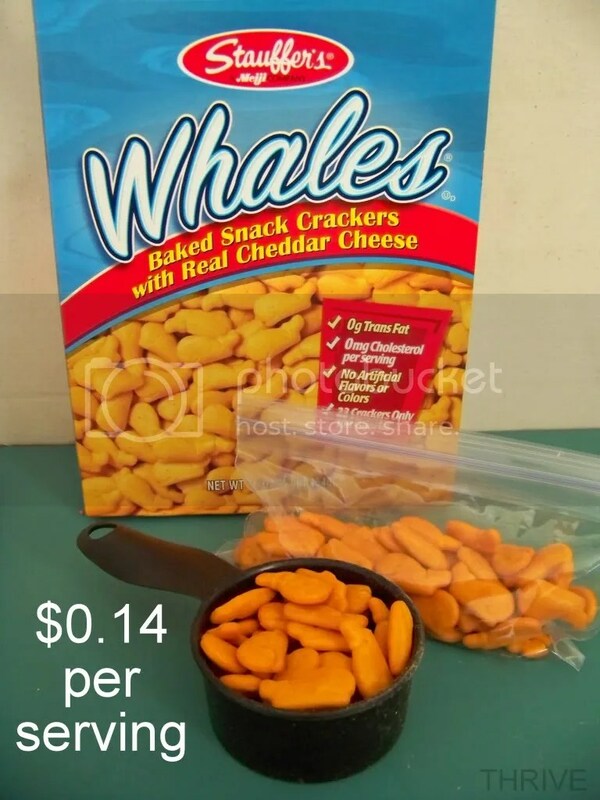 So feel free to make your own tweaks with whole grain crackers, organic produce and nitrate-free meat. 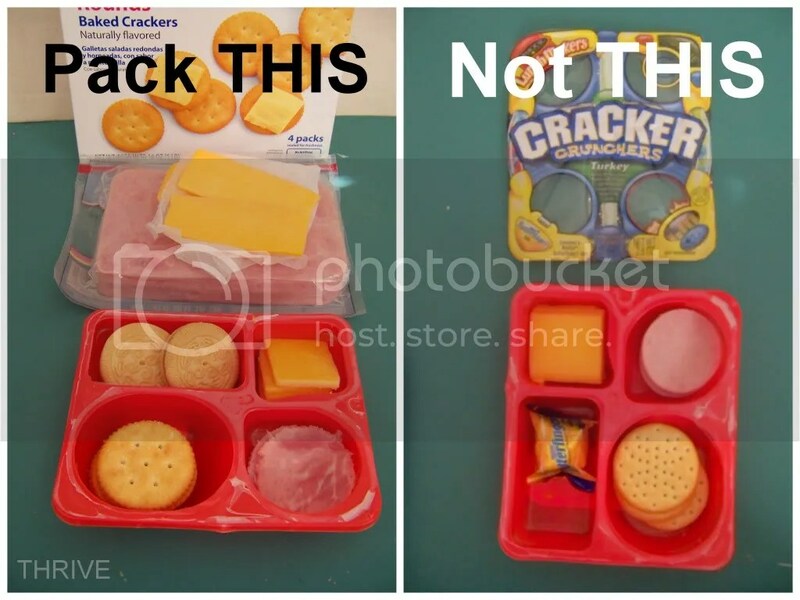 Or try packing a lunchable with mini tuna or PB&J sandwiches. Have fun! 2. Make your kids help with the prep work! 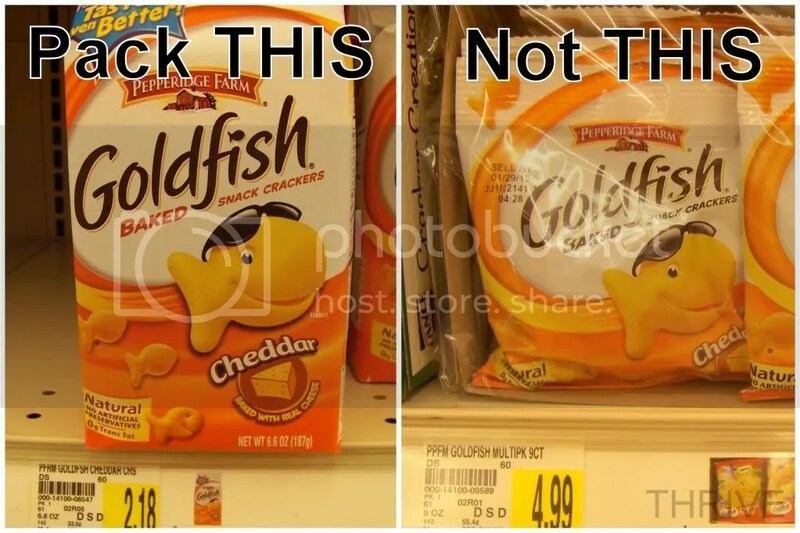 They’re the ones asking for the “cool” packaging so they can help. 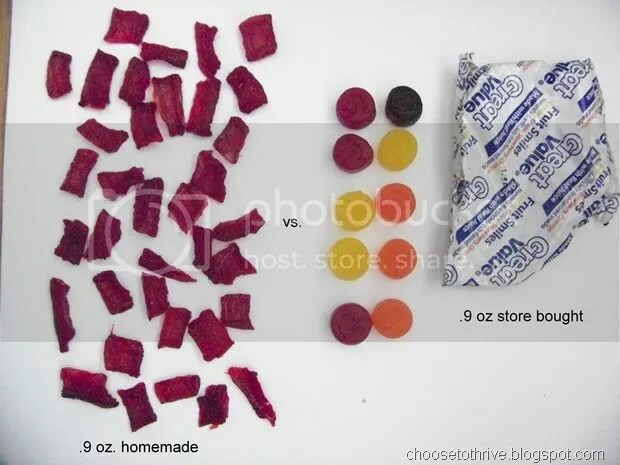 It’s also a great way to teach basic food prep and math skills like measuring ingredients and dividing portions. 3. Have your kids help you shop! Don’t laugh — I’m serious. 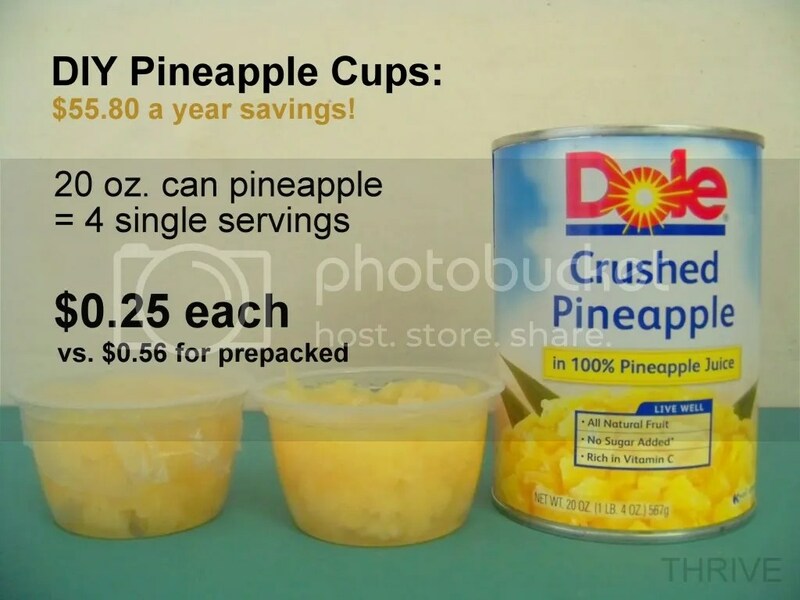 This is a fantastic chance to practice real life math skills as they determine price per unit, ounce or pound. There’s also lots of fun ways to to teach math, spelling and budgeting with kids during shopping trips here. 3. 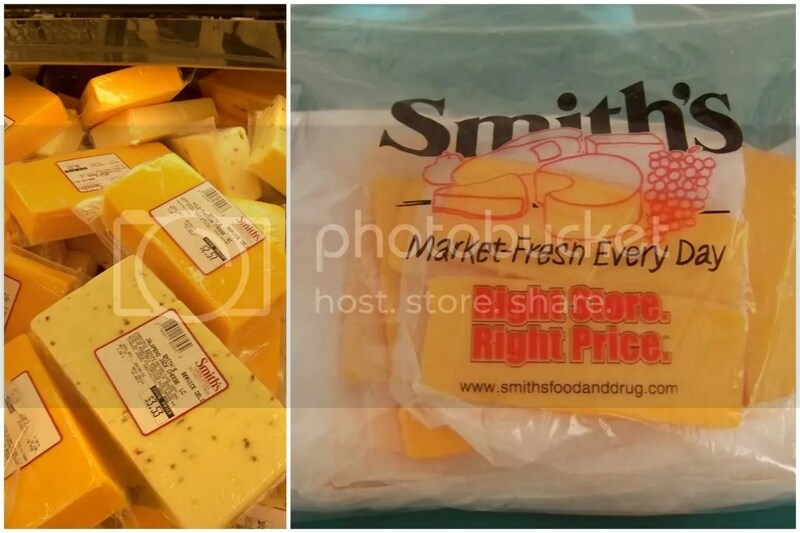 Have cheese for sandwiches or lunchables pre-sliced at the deli. I buy the economy loaves and have them sliced right there at the store for no extra charge. It saves so much time and keeps the portions equal. 4. Rock What Ya Got! 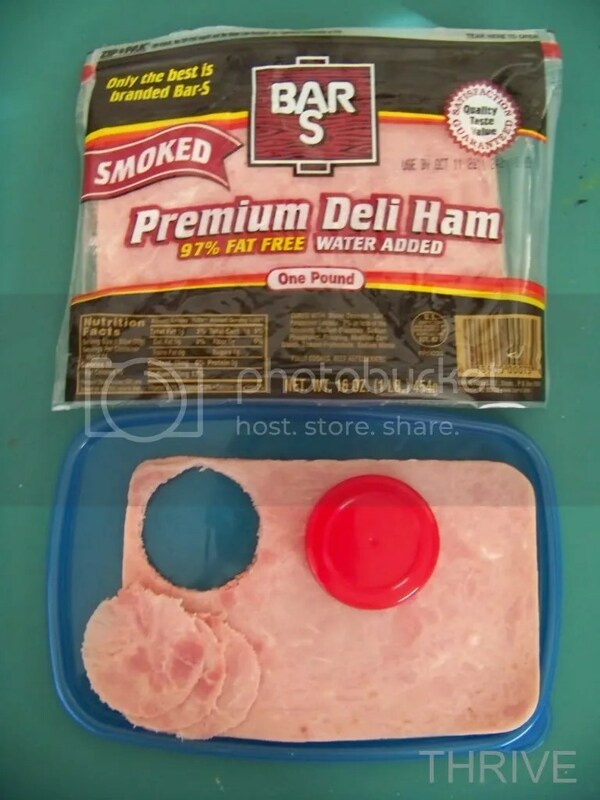 If your kids are like mine and want the meat for their homemade lunchables to be round like the store bought variety, trying using the lid of a spice jar. (My cookie cutters aren’t the right size). Stack the meat in three layers and cut away. The lids from my 2/$1 Walmart spices worked perfectly. And don’t toss those scraps! 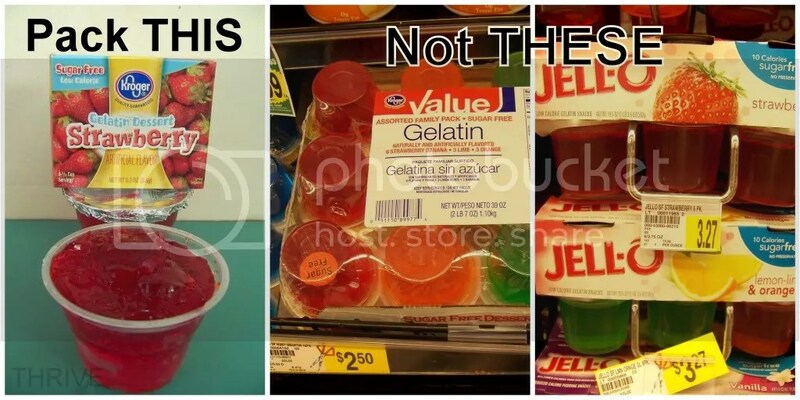 I save mine in a ziploc bag in the frig to use in omelets and salads. 5. Incorporate fresh produce from the garden! Now is a great time to up the nutrition with yummy, home ground fruits and veggies. 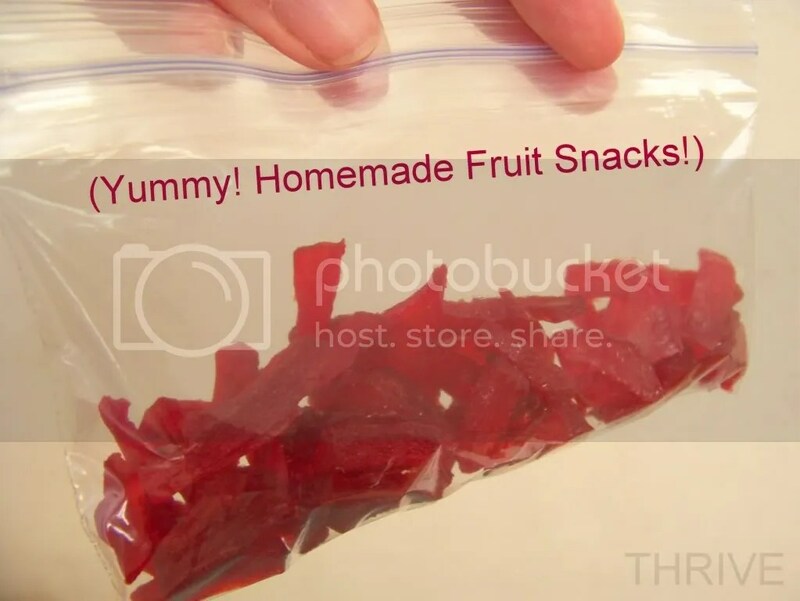 I love it when I can ditch the high fructose corn syrup fruit snacks and send my kids with the homemade variety. They have a soft, chewy texture like other dried fruits and are only $0.01 per serving vs. $0.20 for the cheapest store bought variety! You check out the recipe here. 6. Pennies add up! 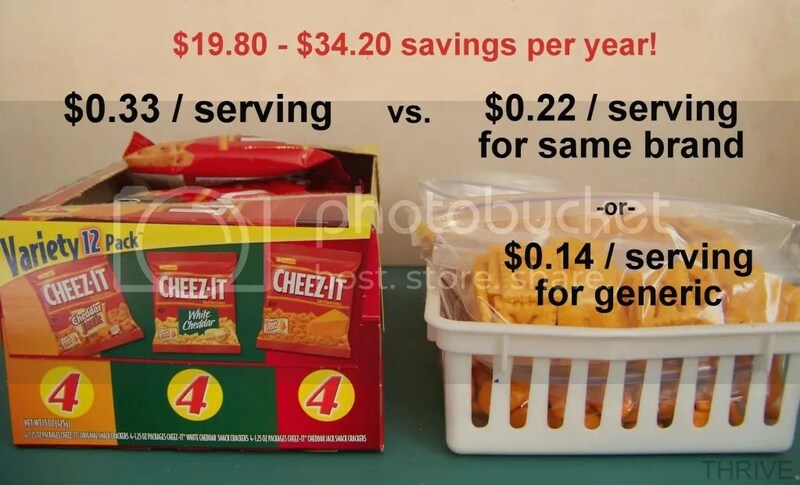 I know some of you may look at $0.25 or $0.50 savings a day and think it’s not worth it. But trust me – it so is! My kids have been back to school for a month now (year round school) and I’ve kept track of what we would have spent to buy the prepackage stuff vs. packing our own. 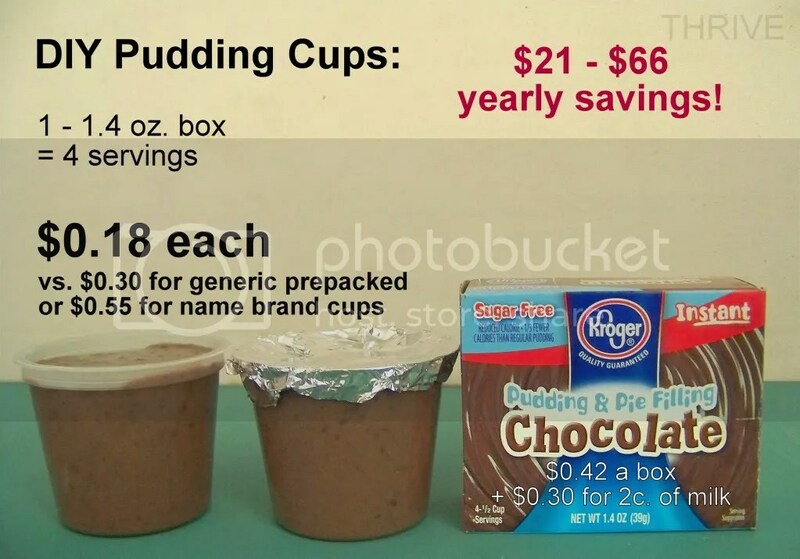 So far our averaging savings is around $8 a week. If our family takes out the money saved each week and transfers it into savings (or puts it in an envelope Dave Ramsey style), that $8/week times 25 weeks of school should work out to $200 by the end of the year. And $200 divided between my four school-aged kids equals $50 a piece, or enough to buy a new pair of shoes, back pack and classroom supplies for each of them. 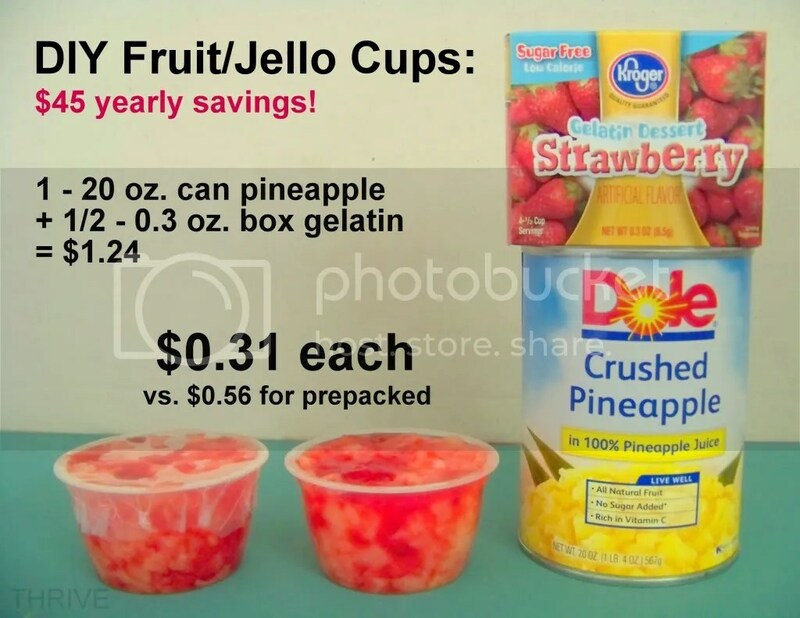 Eating healthier, using less packaging, teaching my kids about cooking-meal planning-math-budgetting AND financing back-to-school shopping for next year? That’s so worth it to me! Hope you and your kids have fun shopping for your own creative ways to make smarter lunch choices! And be sure to stop by THRIVE for more ideas for living and crafting without spending a dime. Hope to see you soon! Posted on September 3, 2012, in All Things FABulous and tagged back to school, csi project, DIY Monday, food, health, healthy-living, kids, lunch, lunchables, money saving tips, nutrition, snack, tutorials. Bookmark the permalink. 10 Comments. Wow! It is so admirable how much you’ve thought this through. Sometimes we all need someone to show us the conclusions, because you’re right, 50 cents savings doesn’t sound that exciting at first. This post caught my eye, first because I just was reminiscing about pb & j sandwiches at lunch time, and then because, well, it’s really interesting how you’ve changed it all up! I think your kids might like my pb & j cookies– they are SO delicious, and could be a healthy dessert! Thank you so much. Like I was telling another fellow blogger I fell into the trap too and now that I think about it. All that money just wasted. And for what? Convenience. Oh well, like the saying goes … You Live & You Learn. I know. Only regret, I wish I knew this sooner. GREAT post!!! 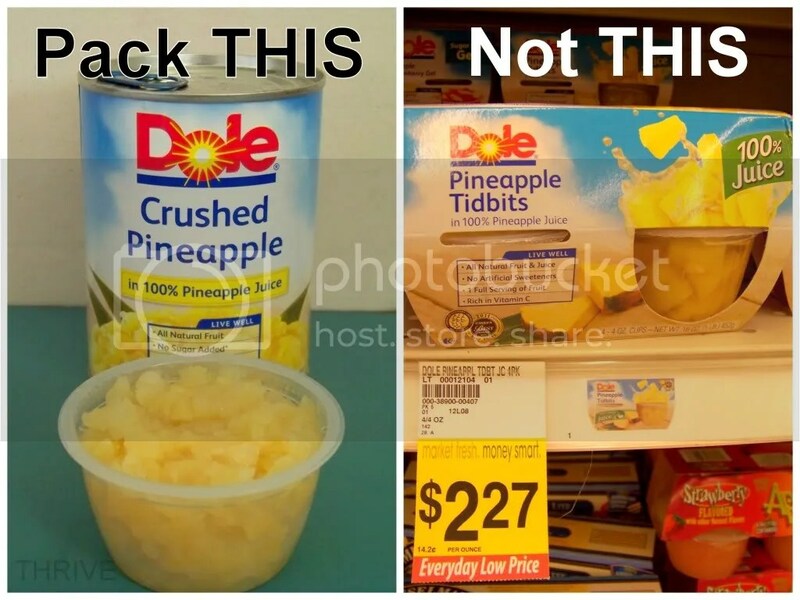 It really doesn’t take very long to pack the healthy option vs the “convenient” one either. Good job on all the pictures. I know. I was a sucker for buying them myself. I was bam-bozzled as many others probably have been too. And now I think about it all that money. Down the drain. The company who made them were probably laughing all the way to the bank. LOL. SMH! This is a very helpful post! I hope that it’s okay that I linked to it from my blog. Thank you! This was full of great tips! I really love using a spice jar lid, genius!